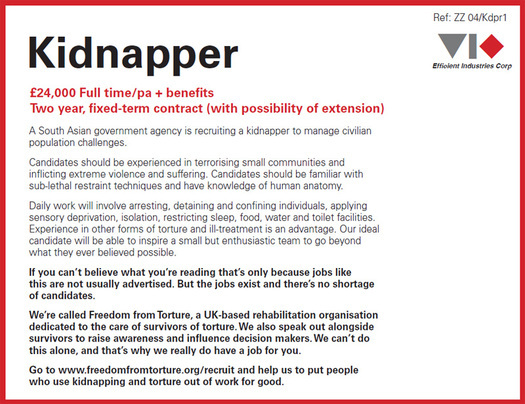 I was browsing the Guardian newspaper’s recruitment ads this week when I saw this ad for a job as a Torturer. It caught me off guard — as it was meant to — and I felt a few seconds of profound shock and dismay. The Guardian, or indeed any reputable paper, was the last place one would expect to see such a repulsive announcement, and yet there it was. The three ads in Freedom from Torture’s new awareness and fundraising campaign deliver perfectly calculated moments of cognitive dissonance. 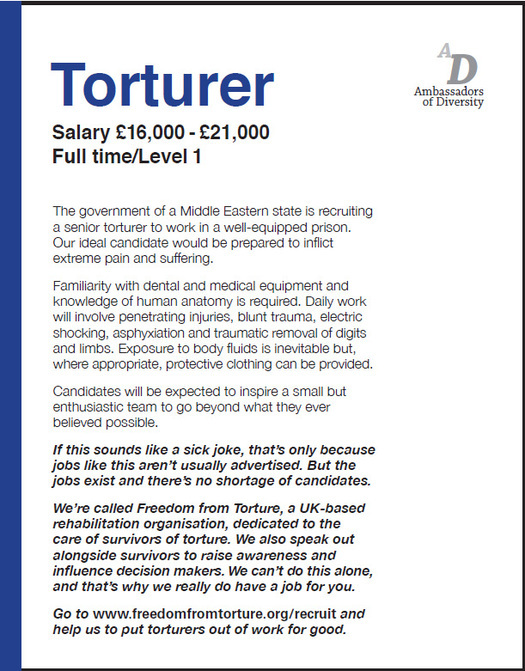 By normalizing the idea of torture as an everyday line of work, a sought-after job (“there’s no shortage of candidates”), and simply listing what the position requires in eminently ordinary business language, they provide a sickening reminder of the reality of torture in many parts of the world. And the ads aren’t shy of naming some abuse-prone territories: the Middle East, Central Africa, and South Asia. The blandly upbeat names and logos — Acorn Industries, Ambassadors of Diversity — are a sardonic touch. Freedom from Torture’s campaign was developed in collaboration with staff from the Ogilvy & Mather advertising agency, who gave their services pro bono, out of commitment to the charity’s work. Mimicking recruitment ads is an audacious and impressively risky strategy. Instead of aiming as widely as possible, the campaign limits itself to a much narrower group of potential respondents. 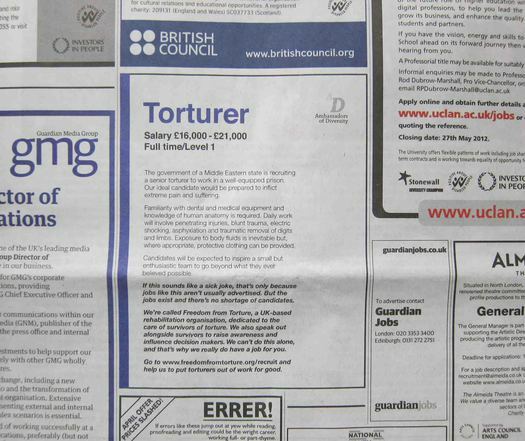 (The ads have also appeared in the UK’s Independent newspaper.) As a means of gaining attention, though, and compelling browsers to read, the ads are far more effective than the routine, all-too-ignorable device of distributing charity leaflets in magazines. Readers who feel inspired to support Freedom from Torture can visit the site and make a donation. 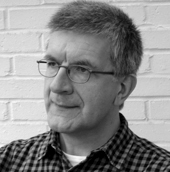 The ads are a sophisticated form of détournement that works by subverting an existing channel of communication. There must be plenty of other platforms that could be infiltrated in similarly imaginative ways and used to capture attention for positive purposes. 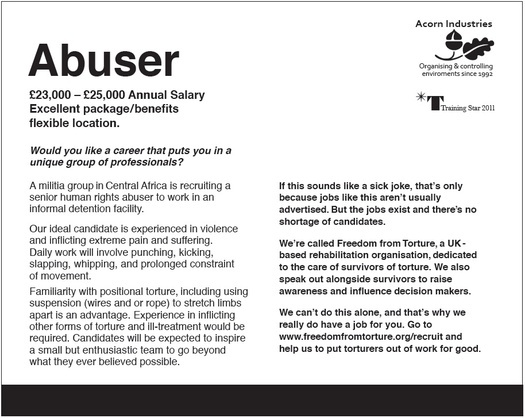 I am just about to run a fundraising evening for Freedom from Torture tonight and I am going to use these adverts on my publicity and information board. I think they are shocking and brilliant. It is moving to see that Freedom from Torture can be so very direct in their approach but with obvious compassion. I shall feed back comments if there are any after this evening.